Becca and Brian's Grand Adventure: Kakadu Part 1: Lions and Tigers and Crocs, Oh My! Kakadu Part 1: Lions and Tigers and Crocs, Oh My! Kakadu National Park and Darwin were two of the areas that Brian had missed on his previous trips and he was looking forward to seeing them this time around. Kakadu is an diverse mix of monsoonal rain forests, mangrove forests, billabongs, cliffs and escarpements, ancient and modern aboriginal art, waterfalls, plunge pools and wildlife. Oh...and lots and lots of crocodiles. As we mentioned in an earlier entry we were a little nervous about this trip with Kakadu Dreams because the company seemed overly geared towards the early-20's party crowd. As we were to find out, this fear was both justified and overblown. Certainly the eco-tour marketed trip started off poorly when not 35 minutes into the journey we ran straight over a small kangaroo going 60 mph. Ker-thud. Ker-thud. Shocked silence in the back followed by "Steaks tonight, anyone?". We were even more dismayed to discover a peculiar habit of Chris, our trip leader. He seemed constitutionally incapable of holding a conversation without maintaining eye contact. While that might be viewed as a positive result of a good upbringing, it was a disconcerting (if not downright dangerous) trait while driving a truck down a highway. Not only was he looking sideways at the passenger in the front seat next to him, but he would also frequently turn himself all the way around to talk to the folks in the back. There's nothing like the experience of speeding down a highway with your driver facing backwards to have everyone scrambling for the seatbelts. Kakadu is a world heritage-listed site not only for its natural beauty, but for its cultural treasures as well. One of our first stops in the park was the Ubirr art site, an area where Aboriginal people have been making rock art for more than a thousand years. While most of the paintings have been dated at less than 1500 years, there is one of a thylacine (or Tasmanian Tiger), an animal that has been extinct on the mainland for 2000 -3000 years. My favorite painting was one of the Mimi spirit figures, but we were equally impressed by the x-ray images of the fish and animals used to teach the children how to hunt and fish. We enjoyed a couple of other scenic stops and mini-hikes including yet another gorgeous northern territory sunset before heading off to the JimJim campground. After being able to just bush camp in the Outback it was a bit of a bummer to have to be back in a campground. Due to the emergence of large numbers of biting bugs however, we did gratefully accept a tent despite our allegiance to swags. Actually our gratefulness might just have been residual thankfulness at being in one piece. Hurrying to beat the other Kakadu Dreams truck back to the campground in the post-sunset darkness, our fearless leader didn't see that he was approaching a T-junction and the truck and trailer carved a nice skidding arc in the intersection as he turned the corner, occasioning yet another mad rush for seatbelts in the back. After dinner we did a brief nature walk. Chris showed us how spiders' eyes reflect back blue light and allow you to find them in the dark. It was actually pretty disturbing to see how many lights were out there shining back at us, and Brian and I were glad we'd changed from our sandals to shoes. After that, we went in search of something a little bigger. Walking over to the billabong next to our campground he started systematically moving his big flashlights back and forth across the water surface. Eventually our patience was rewarded when two much larger red dots reflected back at us. 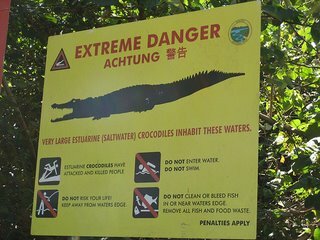 Crocodile! It was a little creepy to watch it silently glide across the water's surface and then submerge. And even creepier thinking how close this was to our campsite. (That tent was looking better and better by the minute). This wasn't our first encounter with crocs on the trip though. We actually started out the weekend by going on an AMAZING JUMPING CROC CRUISE [sounds better said with the monster truck announcer guy's voice]. This involved getting in a boat and cruising up and down the East Alligator River (the early explorers had their reptile taxonomy a little confused...) and watching the scarily numerous crocs sunning themselves on the bank or floating in the river while listening to painfully inane commentary. From time to time a croc (recognizing that this was the snack-mobile) would approach the boat and a crewmember would dangle a hunk of buffalo meat over the side. The idea was to lift the meat just as the croc lunged, causing it to jump out of the water for better photo ops and tourist viewing. While cheesy, it was also very impressive. One of the crocs in particular was huge and gave a great menancing eye as he floated next to our water-level seats. (Let's just say that this was one river you would NOT want to fall into). All in all, the experience left us with a greater respect for (not to mention fear of) the animals, though I have to agree with a lady we met later who said she wouldn't patronize those tours as she "didn't believe it was a good idea to train crocodiles to jump".